The study results have implications for HIV. The simian immunodeficiency virus, unlike HIV, does not cause AIDS in most of its primate hosts. If it took thousands of years for SIV to evolve into a primarily non-lethal state, it would likely take a very long time for HIV to naturally follow the same trajectory. An ancestor of HIV that infects monkeys is thousands of years older than previously thought, suggesting that HIV, which causes AIDS, is not likely to stop killing humans anytime soon, finds a study by University of Arizona and Tulane University researchers. 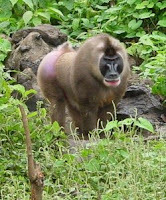 The simian immunodeficiency virus, or SIV, is at least 32,000 to 75,000 years old, and likely much older, according to a genetic analysis of unique SIV strains found in monkeys on Bioko Island, a former peninsula that separated from mainland Africa after the Ice Age more than 10,000 years ago. The research, which appears in the Sept. 17 issue of the journal Science, calls into question previous DNA sequencing data that estimated the virus' age at only a few hundred years. The study results have implications for HIV. SIV, unlike HIV, does not cause AIDS in most of its primate hosts. If it took thousands of years for SIV to evolve into a primarily non-lethal state, it would likely take a very long time for HIV to naturally follow the same trajectory. "HIV is the odd man out because, by and large, all the other species of immunodeficiency viruses impose a much lower mortality on their host species," said Michael Worobey, a professor in the UA's department of ecology and evolutionary biology, who led the study in conjunction with virologist Preston Marx of Tulane University. "So, if SIV entered the picture relatively recently as was previously thought, we would think it achieved a much lower virulence over a short timescale," Worobey said. "But our findings suggest the opposite. If HIV is going to evolve to lower virulence, it is unlikely to happen anytime soon." The study also raises a question about the origin of HIV, which scientists believe evolved from SIV. If humans have been exposed to SIV-infected monkeys for thousands of years, why did the HIV epidemic only begin in the 20th century? "Something happened in the 20th century to change this relatively benign monkey virus into something that was much more potent and could start the epidemic. We don't know what that flashpoint was, but there had to be one," Marx said. Finding these virus strains trapped on Bioko Island settles a long-standing debate, Worobey said. "It's like finding a fossilized piece of virus evolution," he said. "We now have this little island that is revealing clues about SIV, and it says, ‘It's old.' Now we know that humans were almost certainly exposed to SIV for a long time, probably hundreds of thousands of years." "Reconstructing the evolutionary past by comparing the genes of these viruses is like looking out onto the ocean," Worobey said. "You can see a long way, but you don't know what lies beyond the horizon. At some point in the past, you don't know what happened. There is a whole lot of ocean out there that you can't get at with the methods that we have been using in trying to tease apart the relationships among these pathogens." According to Worobey, SIV was distributed across the African continent before Bioko Island separated from the continent about 10,000 years ago. "When that happened, whatever viruses were circulating at the time became isolated from the virus populations on mainland Africa," he said. Marx, a virologist at the Tulane National Primate Research Center, tested his theory that SIV had ancient origins by seeking out DNA samples from monkey populations that had been isolated for thousands of years. His research team collected bush meat samples from Bioko Drills (Mandrillus leucophaeus). The scientists found four different strains of SIV that were highly genetically divergent from those found on the mainland. Worobey then compared DNA sequences of the viruses with the assumption that the island strains evolved in isolation for more than 10,000 years. The computer modeling showed the rate of mutation to be much slower than previously thought, indicating that the virus is between 32,000 and 75,000 years old. These dates set a new minimum age for SIV, although it is likely to be even older, Marx said. Worobey said the study has implications for a lot of rapidly evolving pathogens. "Our methods are great to describe and predict the short-term changes of viruses like the flu or HIV, but we need to be skeptical of inferences in deep time. We found there is a big disconnect between the rapid evolution for which those pathogens are famous and the incredible degree of conservation we've found." "Being able to study these viruses in an isolated setting is a unique opportunity," he added. "As far as we know, there is no other place like Bioko Island," Worobey said. "Nowhere else could we do this kind of deep time calibration. Some of the primate species on Bioko only have a few hundred individuals left and might go extinct in the not-too-distant future. We might not have been able to do this research 10 or 20 years from now." "Looking into the eyes of these animals and knowing they carry the progenitor of HIV in their bodies sends a shiver down my spine."